The surface of a diamond attracts grease of any form and once a diamond has a thin layer of grease or film of dirt your diamond is no longer reaching its maximum beauty or potential. For a diamond to give off its fire, scintillation and brilliance the surface of it needs to be clean for the light to enter and be released. If your diamond is dirty the light enters and does not return to the eye and so is no longer sparkly or beautiful. A good habit to get into is the cleaning of your diamond at least once a week or whenever you have worn your diamond near or around grease and dirt. Warm soapy water with a soft tooth brush is sufficient to clean your diamond, making sure you get in and behind the setting of the diamond on top, below and around the sides. Another good habit is to have a place where you always put your beautiful diamond ring when you want to do something that is not diamond friendly. Diamonds are housed in metals which ultimately wear away, scratch and get dented. Rings are not indestructable and you do need to care for them so they remain as stunning as the day you bought them. Having an annual check of claws is another good habit to get into. I always feel Decemeber is a good time before the party season is in full swing. Have your rings checked and re rodium plated so that they are at there best for this time of year. Set your budget before you start because there will always be an exquisite diamond to fall within it. Once you have a budget, decide what you want most out of your diamond – size over quality/colour or colour over size. Finding your engagement ring is a special and important time, so take your time and enjoy the process. Try on lots of rings, work out what it is you love. Like falling in love with your partner, you will know when you have fallen in love with a ring or design… so trust your instincts. When you are thinking about a ring design the setting is an important factor to consider. One of the most common ring settings is a prong or claw setting. A prong is a tiny metal claw that grips the stone holding it firmly in place. Prong settings can be either four or six prongs and are an excellent way to see more of the diamond because there is very little metal present. More light can pass through the diamond enhancing its brilliance. The pavé setting is closely set small diamonds in a ‘honeycomb’ pattern. This setting offers minimal visibility of metal giving an effect of continuous sparkle. They make the central stone stand out giving extra sparkle to lower set stones or a less brilliant stone. The bezel setting encircles the diamond with a thin metal rim that is custom made, holding it firmly in place. The bezel is ideal for active lifestyles as it has more protection around the diamond and won’t snag. Full bezel settings completely surround the diamond and half bezel settings leaves the sides open. 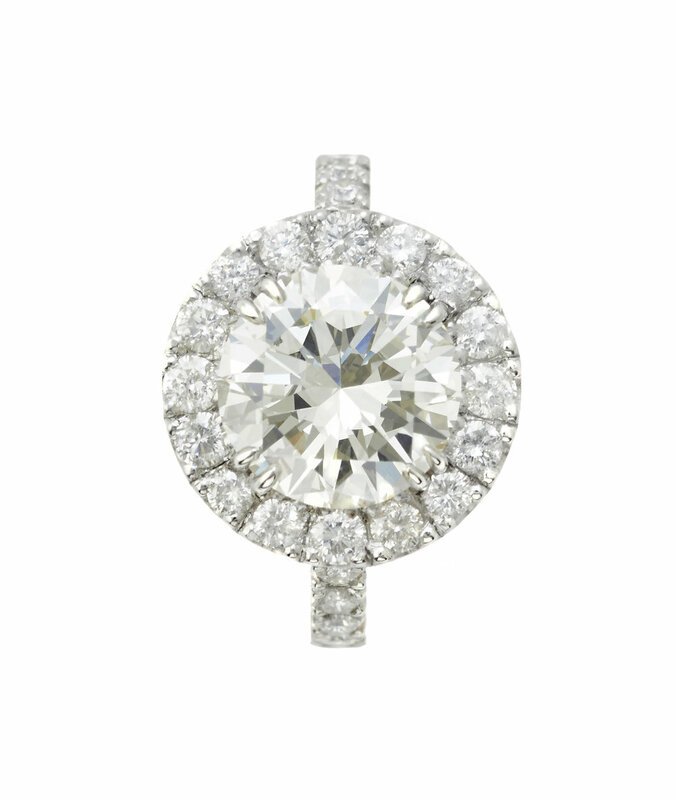 The halo setting is diamonds or other gemstones set in a concentric circle or square around a central stone. This setting makes the central stone appear larger and increases the overall sparkle of the ring. A great option to boost the appearance of a small central diamond. The tension setting is a metal band that secures the diamond in place suspending it on both sides of the shank. It allows maximum viewing of the stone but not as secure as other settings so should be checked regularly. The stones are placed so closely together that no metal is seen. The stones can either be cut to interlock with eachother or held in place with a thin metal bar below the stones. This setting allows for a dazzling array of uniformity and needs to be checked regularly. The flush setting has the gemstones embedded in the band. The channel setting is a secure way to set diamonds into the band of a ring. The diamonds or gemstones are set closely together decorating the sides of the band or the entire band. This setting is popular for wedding bands or stackable rings that don’t feature a central stone. The bar setting is similar to the channel setting but where the channel setting encloses the diamonds on all sides, the bar setting leaves the diamond exposed on two sides. The stones are set separately between slim vertical metal bars and allow light to enter the sides of the diamonds. This setting complements a centre stone or can be an impressive choice for a wedding band or stackable ring. Gone are the days when a wedding ring was nothing more than a simple band of gold. Nowadays, they can easily compete with an engagement ring in terms of flash, color, and uniqueness – and that's not likely to change any time soon. "Brides are looking for a band that not only complements the ring but can be worn on its own," says Isaac Gurary, president of Aspiri by Maiden Lane. "Some of the biggest trends I've seen lately are stacked eternity bands, colored statement stones, multistone statement bands, and curved bands." Stylish newlyweds have taken to stacking different bands on the ring finger, making for a look that's bigger and more statement-prone than the classic engagement-and-band formula. For Gurary, the trend is here to stay. "Stacked rings aren't going anywhere any time soon, and I think they'll become more popular than ring jackets," he said. "More and more women are wearing their wedding bands as everyday, standalone pieces and wearing the engagement ring on the right hand. Stackable rings are versatile and work for that, while jackets don't always work alone." Gurary was responsible for Kate Bosworth's gorgeous bands, crafted under the Ocappi label, and they're a prime example of stunners that work together or alone. "For her, we designed two custom bands to fit around her vintage art deco engagement ring, something else that's been popular lately," he said. "One has 12 horizontally set baguette stones to represent each month of the year, and the other has 18 for a more art-deco feel." He suggested traditional-leaning ladies consider a braided band as a way to be on-trend yet still simple; sparkle-lovers should mix as many thin, glitzy bands as they please. "Stackable eternity bands in yellow, rose, and white gold, paired with white or colored diamonds really make a statement, especially when stacked. I've seen a trend of pairing mixed precious metal bands, which adds a colorful element." Definitely something to think about when designing your wedding rings.